I make digital artwork continually and its the core of my freelance work but in the past year I have really wanted to start making textile work again on a more permanent basis and got my Etsy Shop up and running - Sarah Jarrett Hand Made. I'm also taking it on a step further and beginning to sell at art and craft fairs. 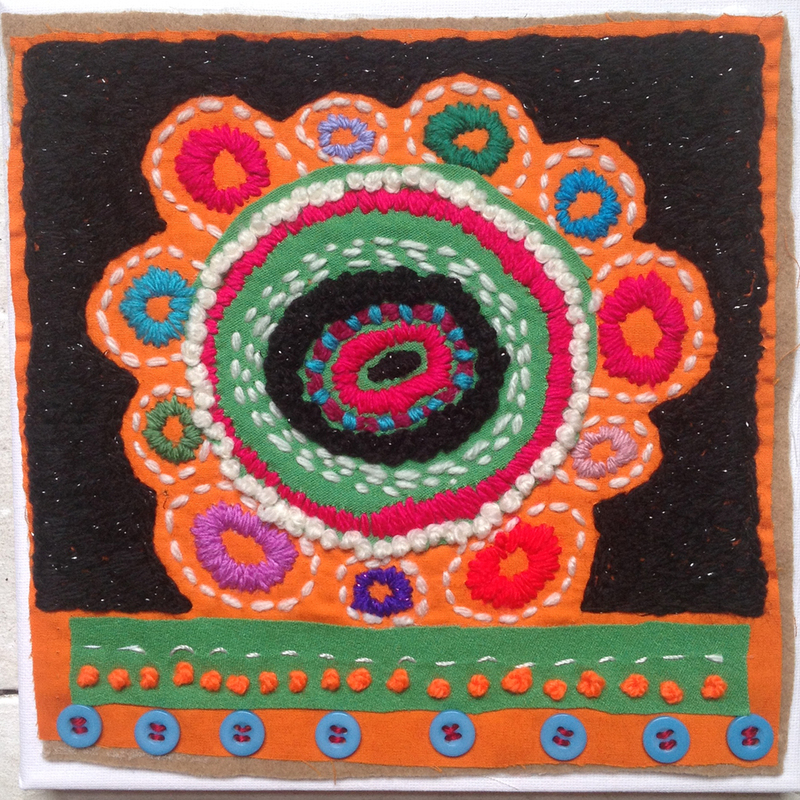 I'm really passionate about Textile processes and particularly love embroidery, weaving, crochet and knitting. My pieces are quite theatrical, colourful and bold. I like mixing processes together and always aim to produce something very unique. I've been making both Textile Wall Art pieces and Textile jewellery - mainly necklaces. I'm going to be selling at Dartmouth Artisan Market on Saturday 25 March in the Old Market Square. I love creating pictures that tell a story and I've spent a lot of time lately building on a collection of images with a narrative. Many of my ideas come from reading, I read every day, mainly fiction and love the escape this offers but I also collect lots of ideas from music lyrics, lines from overheard conversations and obsessive listening to Radio 4 while I'm working. I like ideas that seem dreamlike, surreal and nonsensical and the fact you can get away with that in a picture. In the picture above 'Horses in my Dreams', the horse is blind and cannot see where it's going, it has wheels instead of hooves, the rider is disconnected from the horse - lying along its back - all impossible but giving flight to the imagination and hopefully resonating with the viewer. This is an endlessly fascinating process to me, as is the physical process and method of picture making. These are all made using digital collage. One of the aspects I struggle with most as an Artist is having several quite separate threads to my work. Commercially this is obviously a plus because it allows me to work on quite diverse projects but it can be challenging too. I find I tend to focus on one strand for a time and then move on to another when I really need a break from that particular way of working. I feel like I am always juggling and balancing but I cannot imagine it not being this way. For quite a while I have been trying to find a way of shifting paper cut collage by hand to a digital equivalent. This has involved a lot of time building up my digital library of collage scraps, type, letters, numbers and surfaces but it is now starting to really work and I have been doing quite a lot of new still life pieces and some new narrative storytelling illustrations. Making collages is endlessly attractive and fascinating to me and I'm enjoying this new process. I suppose a collage is like building a jigsaw of elements and positioning it all together. I like to completely disregard perspective and I often flatten things and see them in terms of pattern and design. I've always done this - Art lessons at school were hell because I made everything flat and my Art teacher constantly told me 'you cannot draw' but in finding my own way as an Artist I soon learned that everyone brings something different to the table and your visual voice is so unique to you. One aspect of my freelance work I really enjoy is designing images for book covers. My editorial work is represented by Arcangel Images. I love the creative possibilities this offers and have included some of my recent and favourite front covers.